With Diwali around the corner, it is certainly time for some sweets and snacks suitable for the festive occasion. Thengai Burfi is one my childhood favorites. 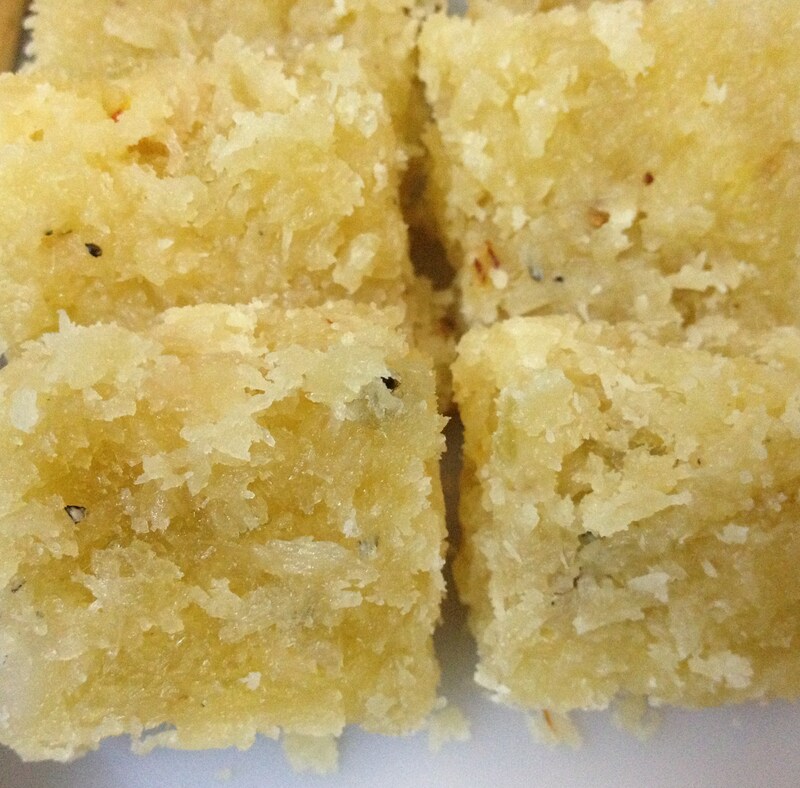 Coconut based burfi or urundai/laddu can be made in different styles – with milk and sugar, with sugary condensed milk, with milk powder and sugar, with sugar syrup without milk… thengai burfi (square shaped sweet) or thengai urundai (coconut balls) is something the tongue and teeth wouldn’t forget for long – Tongue for the taste of it and Teeth for the extras that always cling on to it. The Chewy, Juicy, Sugary, Coconut Milky flavor of the sweet takes me to a special day called MISSION SUNDAY. My early years of schooling in an Anglo Indian School introduced me to a bit of Christianity and to the Sisters of the Missionaries. MISSION SUNDAY used to be a fun filled day of events, something equivalent to Carnivals in European Schools. A day of food, games and fun activities – all done by combined efforts of Teachers, Parents and Children. Nothing to do with religion, it was a Sunday devoted to opening stalls, selling your home products- especially food cooked by mothers/grandmothers, earn money and donate it to school. I remember Amma used to make Thengai Burfi in different colors – Pink,, Red and Yellow and Amma and me used to be a team selling thengai burfi. As Stallmates, we used to earn a bit… that was a very happy feeling of being a junior entrepreneur at an early age. 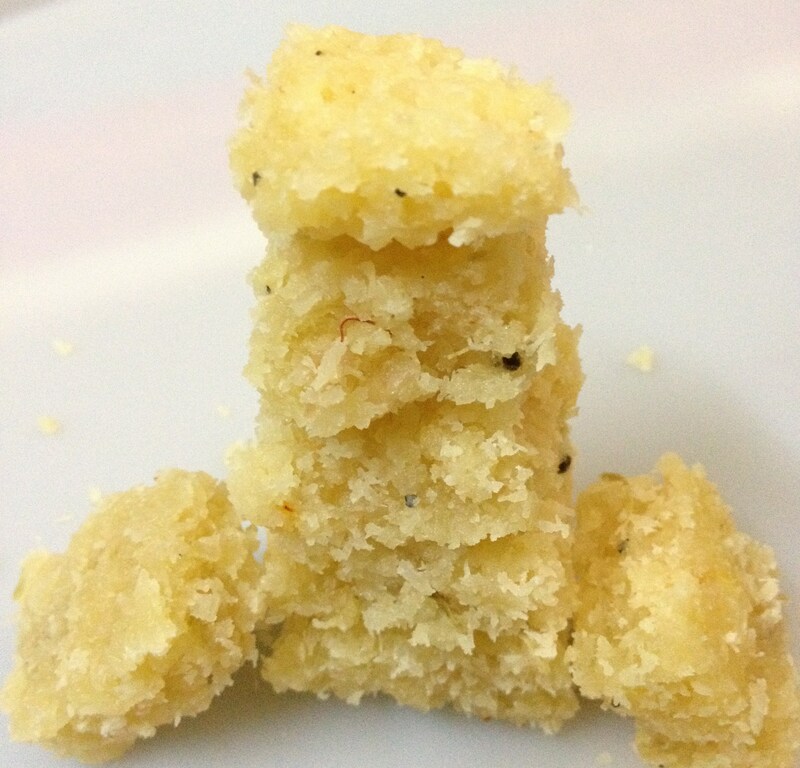 So that’s the juicy story of Thengai Burfi. My cousin ‘S’ would remember more as we went to the same school and what more we did in our stall together for Mission Sunday is something to discuss about. My memories are somehow stuck up with Coconut Burfi. 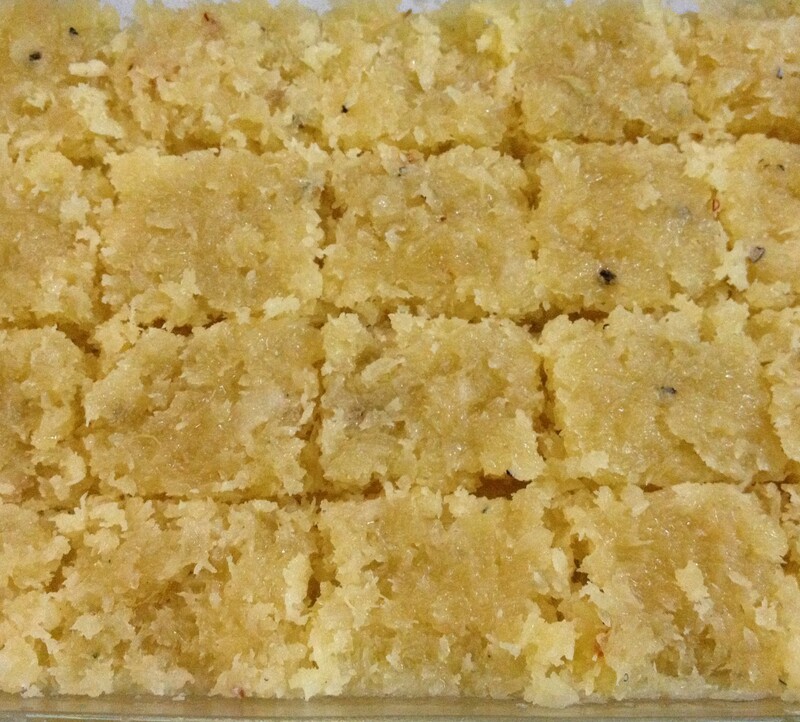 This version of Thengai Burfi is with the basic ingredients – coconut and sugar. There is no milk and no food color in the recipe. As I had saffron, I chose to bring in the exotic flavor of saffron and its beautiful mild yellow color to the burfi. 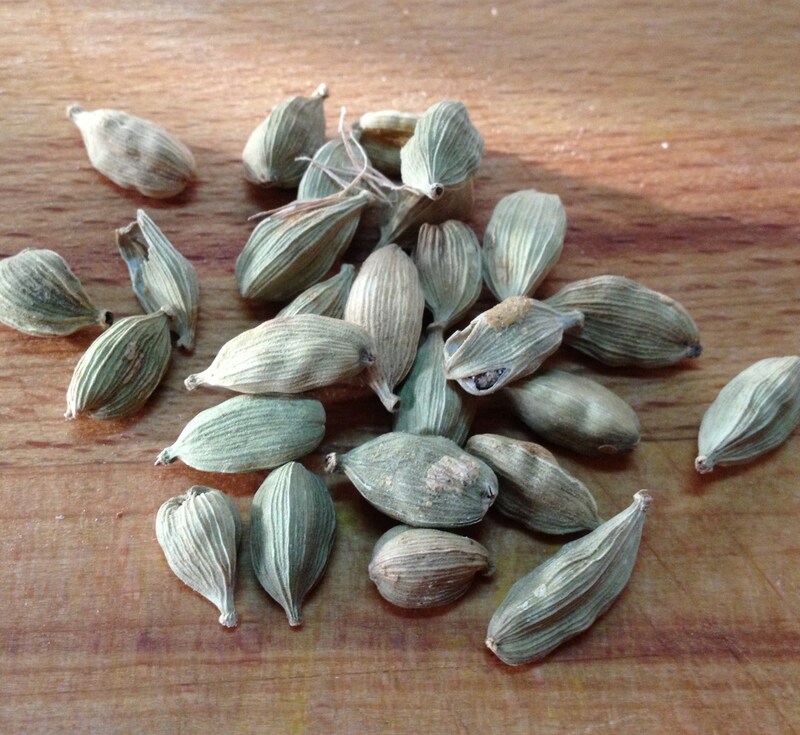 Also added is cardamom to complete the combined flavor of the sweet. Juicy Coconut Burfi is ready. 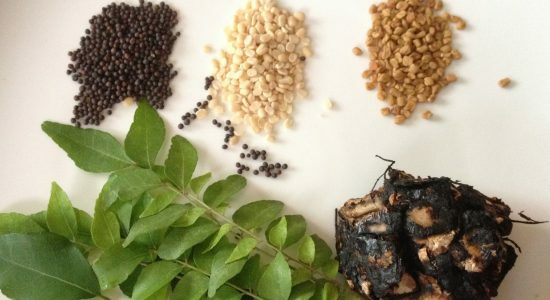 Saffron is optional. 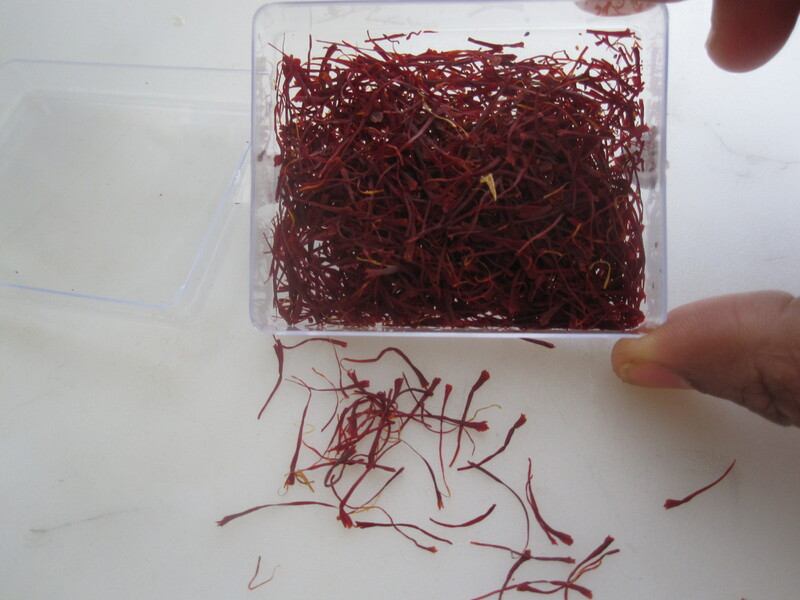 The aroma and subtle yellow color are the true benefits of saffron. 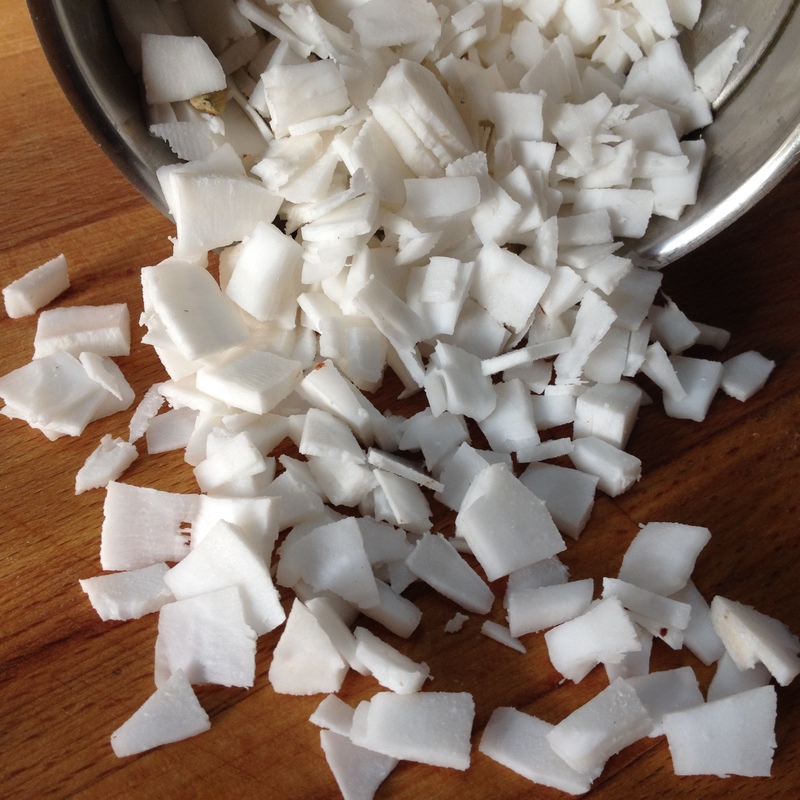 Those who prefer the original white color of coconut shall avoid saffron. Sugar can be altered as per taste preference. 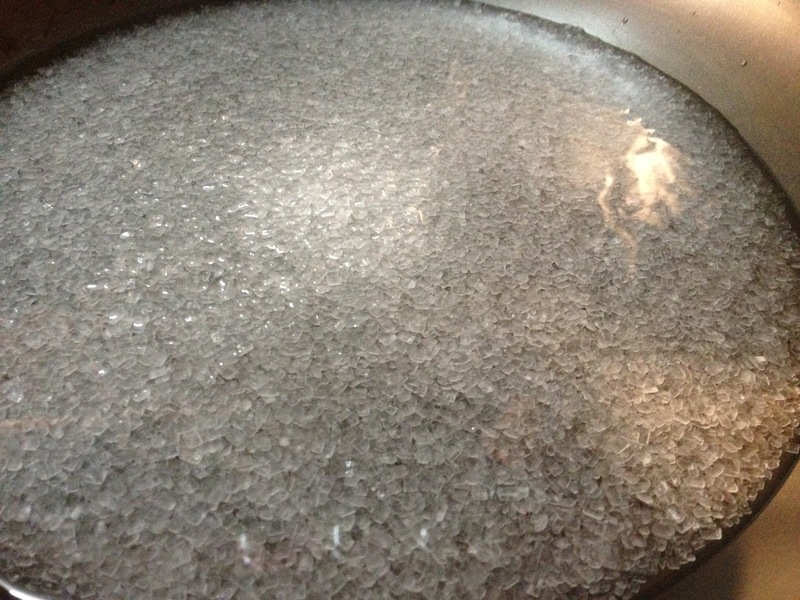 More the sugar, finer the structure of pieces. I have stuck to medium sugar.